It wasn’t at all surprising to see Final Fantasy VI‘s mobile release described as garbage. Final Fantasy VI is considered to be one of the greatest games of all time, gamers have a tendency to be negative, and the game does indeed look like fresh garbage. What was shocking was that many insisted that the awful new graphics were an improvement. Worse, they claimed the only reason anyone would prefer the original was nostalgia. Everyone has their own tastes, and I’m sure some people like MS Paint chic. Still, it seems ludicrous to state that the bargain-basement version of FFVI is the superior one, especially when anyone willing to spend five minutes in the App store can find a better looking game for free. Look, I have nothing against updated versions of old classics. I’ve sunk many hours into remakes like Tactics Ogre: Let Us Cling Together. And while I will readily admit that Final Fantasy VI is my favorite game of all time, I’m not going to pretend it’s untouchable. Its graphics are dated. Ted Woolsey’s translation is far from exact. It’s packed full of bugs. But that doesn’t mean I’m going to pretend cheap crap is acceptable, especially when they can’t even manage to spellcheck their own text. If this was some tiny indie, I might agree, but this is Square Enix, one of the biggest companies in gaming. They’re charging $15.99 for this title, and it doesn’t look like they’ve put any effort into it at all. The gaming community should be demanding more. It’s fine if you don’t like pixel-laden sprites, or if you don’t care about FFVI‘s color palette. It’s even fine if you think the latest remake is good, although I may sideye you for saying so. Just don’t excuse low quality junk simply because it looks new. 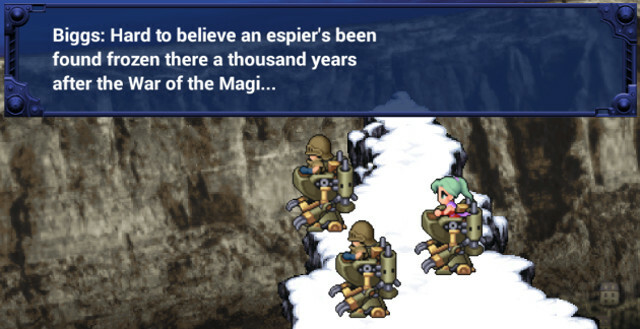 If Square Enix decides to give FFVI a real remake, complete with beautifully rendered graphics, I’ll be there. Until then, I hope no one wastes money on their mobile offerings. If Square Enix wants money from gamers, they’re going to need to work for it.